This elaborate fountain was commissioned by Bryant and May to celebrate the abolition of the proposed match tax in 1872. Erected by public subscription and demolished when the road was widened in 1952/3. 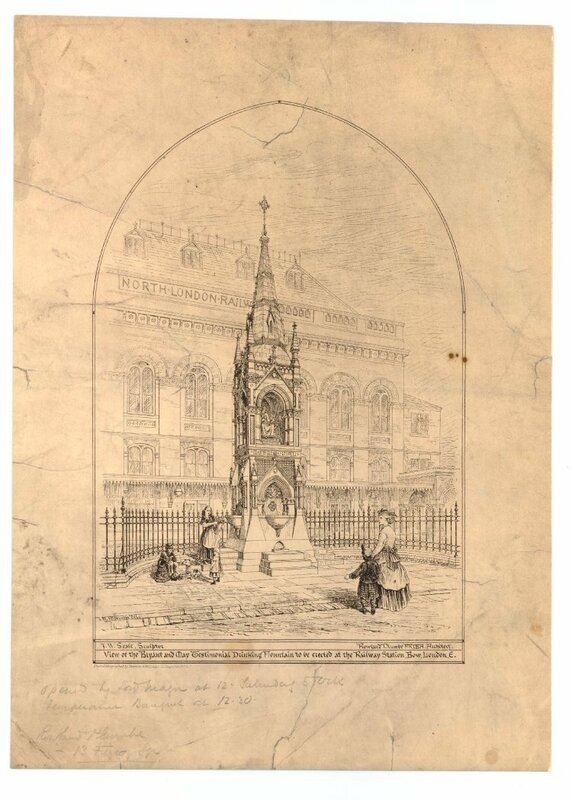 Our picture, a print held by the British Museum, shows Bow railway station behind the fountain. The print has the pencilled note: "Opened by Lord Mayor at 12 Saturday 5 Oct / Temperance Banquet at 12.30". The Lord Mayor in October 1872 was Waterlow. The picture postcard showing the station with the fountain in front is in the John Alsop collection and comes from Disused Stations which provides a very thorough and well-illustrated history of the station (1850 - 1965). Though lost the memorial is not entirely forgotten - there is a plaque commemorating it a little further to the east.